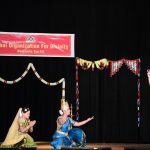 “Melody of Compassion” – a musical ensemble directed by Vidushi Rajarajeswary Bhat of Houston was a fundraiser concert organized by Global Organization for Divinity (G.O.D.) at Houston on Dec 22, 2012 at Turner High School Auditorium, Pearland TX. 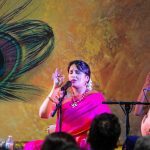 The concert had the hallmark of talent on every single dimension – on vocal, the sister duo Keerthana and Kruthi Bhat, on chitraveena Vishaal Sapuram, on mridangam Mayavaram Siva, on ghatam Sreenivas Ponnappan, on tabla Aditya Srivatsan, on drums Sanath Aithala, and ably supporting on the tambura was Shalini Srivathson. 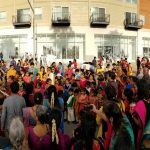 The fundraiser was held to raise money for G.O.D.’s cause of supporting Indian NGO, Sri Sandeepani Gurukula Trust’s construction of a charitable healthcare facility in Govindapuram, Tamil Nadu. The two hour concert was packed with carefully handpicked pearls of compositions, strung with silken threads of melody, harmony, rhythm and soulfulness. 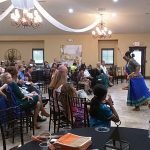 It held the audience — which included Honorable Mayor Delores Martin of City of Manvel, Pat Jasper, Director of Folklife and Traditional Arts at Houston Arts Alliance, and several other dignitaries and community leaders — absolutely spellbound. Opening with compositions from stalwart composers of South Indian classical music Muthuswamy Dikshithar, Syama Sastri and Lalgudi Jayaraman in colorful and contrasting ragas and variegated talas, the team kept the audience gripped as they continued on to presenting compositions from the saints of Northern India – Sant Namadev, Tukaram and others. The Bhat sisters stole the hearts of connoisseurs with their vibrato-filled repetitive renderings of the compositions, duly credited through the thunderous applause from the floor. 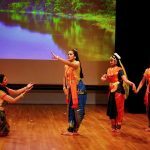 The highlight of the choreography was the presentation “Sadaa Venu Gana Lolane Muralidharane Sandeepani” – a special composition by the director Vidushi Rajarajeshwary Bhat. The phrase (pallavi) highlighted both the cause of the event and universal peace/devotion to the Lord. Classically termed ragam-thanam-pallavi, in this segment Keerthana, Kruthi and Vishaal chose to elaborate the phrase beautifully in the major melodic scale “Shanmukhapriya” and conveyed to the audience the cause for everyone was gathered there — to enable “Sandeepani” Gurukula Trust’s social work which is inspired by His Holiness Sri Sri Muralidhara Swamiji. The segment was topped off with the concerted percussive brilliance of Siva, Sreenivas and Aditya. 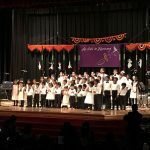 The choreographic theme of the concert — of world peace, devotion and compassion — was evidently portrayed with song selections that included an Arabic number and Michael Jackson’s “Heal the world” by the ensemble. Being G.O.D. USA’s first ever fundraiser event, the concert raised substantial money to help the charitable cause in India. During the event Sri Ramanujam ji, director of Sri Sandeepani Gurukula Trust, also spoke on behalf of the organization and showcased their social work in rural India.